The irrepressible force of the Toccata from the famous “favola in musica” opens the curtain to a sequence of symphonies, ritornelli and dances, the instrumental interludes of the Monteverdian operatic masterpiece., whose pieces follow each other evoking mythological passages and late-Renaissance atmospheres. Using simple modulations of major third chords in a sequence of quickly repeated notes and rapid modules, Passing I recreates a musical texture without dissonances. The complexity and the dynamic tension are generated by the enhancement of the polyrhythmic potential of the accordion. Domenico Scarlatti was without doubt the most original keyboard composer of his time, he wrote 555 sonatas for the harpichord. These three Sonata are presented in a refined accordion transcription that provides them color and vitality. In the Sonata in B minor K 87 it magnifies the expressive melodiousness of four-part contrapuntal polyphony. Drums are heard, accompanied by trumpets, in the very fanfare-like Sonata in E major K. 380. We hear in this sonata an echo, in miniature, of the music of court ritual that must have been part of the everyday life of Scarlatti’s patron, employer and pupil, the Princess Maria Barbara of Portugal and Spain. While in the brilliant Sonata No. 17 in F major shows a strongly reminiscent of Spanish dances and the accordion amplifies the rhythmic excursions. Enigma Variations is a collection of musical caricatures of Elgar’s friends. This lyrical movement portrays a warm conversation between the composer and his friend August Johannes Jaeger. The name of Variation No. 9, Nimrod, is a play on words, as the biblical “Nimrod” was a great hunter, and the German word meaning “hunter” is Jaeger. All the works are composed using camouflaged motifs by Mozart and Beethoven. Throughout the XVII Century, the melody of Lachrimae Antiquae – also known as “Flow my tears” – has traveled Europe becoming among the best known songs of the time. This piece has been transcribed from the 5-parts score, where the accordion recalls the sounds of the harmonium and the viola da gamba’s expressiveness. The English Nightingale, a well-known piece for solo flute from the XVII Century Flemish school is transposed to the accordion, which can be seen as nothing more than a “wind keyboard”, in this sense kindred to the flute. In this naturalistic page, the melodic virtuosities reproduce chirps, trills and ornaments that have influenced the European instrumental music of the Baroque Era. A contemporary dissonant texture of chromatic intervals and sharp sounds reveals a more archaic structure, conceived in an exotic mode, nurished by Indian and African influences. The piece, originally written for violin and violoncello has been transcribed and arranged for accordion by Claudio Jacomucci. A three-subject fugue suddenly stops… It is the last unfinished counterpoint of Die Kunst der Fuge. The last page of the manuscript of the XIV contrapunctus, bears the words “during the writing of this fugue the composer died”. Although this is unlikely, since J.S. Bach was almost completely blind in the last year of his life, the Art of Fugue is recognized as one of the most complex works ever written and is universally considered one of the highest vertices ever achieved by contrapuntal polyphony in the whole history of music. The repetition at great speed, of trills, tremoli and arpeggios, generate a dense and saturated texture of movement inside. Like the “Op art”, this technique creates an illusion for the listener to perceive, instead of a mass of static sound, the atomic swarm of the sound material, a mass of sound. The version of the second study for organ, is proposed here in a transcription for two accordions. © With permission of SCHOTT MUSIC, Mainz-Germany. It is a tribute to a dear friend who was with my family for fourteen years. As an attentive and patient listener, he was almost always present during the long hours of study, rehearsals, recordings, lessons. A cosmopolitan, he loved to travel, venturing alone in the cities, climbing the mountains, losing himself in the woods, repeatedly risking his Life. He always lived in freedom, despite warnings, risks, dangers, sanctions. In 2016, Lupo -italian word for Wolf -, a small black and white dog, ironically, was killed by a real wolf on the hills of Urbino, Italy. 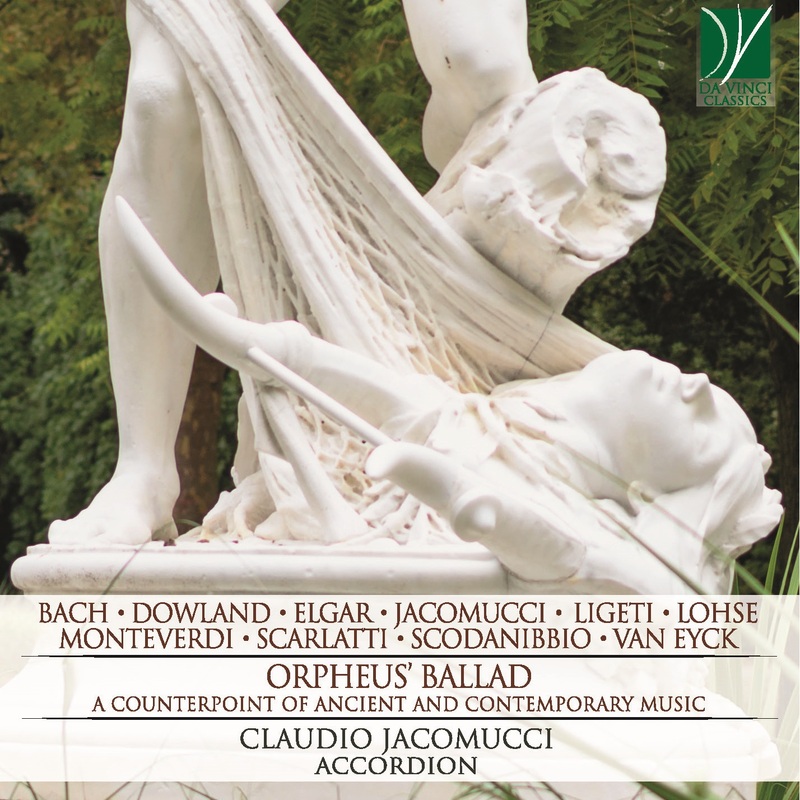 Claudio Jacomucci was graduated with honors as a classical accordionist from Grenoble Conservatory (France) in 1992. He was also graduated as an Alexander Technique teacher from the Alexander Technique Centre in Amsterdam in 2000. He studied Indian Music (karnatic) at Amsterdam Conservatory. Winner of international contests such as Grand Prix International d’Accordéon in St. Etienne (1988), Trofeo Mundial de acordeón (C.M.A.) in Cuenca (1990), Premio Città di Castelfidardo (1990) and Arrasate Hiria (1994). He has premiered a number of new works collaborating with composers such as Luciano Berio, Franco Donatoni, György Kurtag, Luis De Pablo, Boris Porena, Nicola Sani, Mario Pagliarani, Lucio Garau, Gabriele Manca, Dimitri Nicolau, Miguel Ruiz Gil, Fernando Mencherini, Giorgio Tedde, Carlo Crivelli, Akemi Naito, Francoise Barriere, Maxim Seloujanov, Oliver Schneller, Paolo Marzocchi, Riccardo Vaglini, Daniel Glaus, Rico Gubler, Ned McGowan (who often dedicated their work to him) and as a composer himself. He has been performing in Europe, USA, China, Mexico, Russia in many festivals and institution such as Cornell University (USA), Berlin Philharmonic, Concertgebouw in Amsterdam, Salle Messiaen in Paris, Teatro alla Scala in Milan, Gaudeamus Foundation in Amsterdam, Synthese Festival in Bourges (France), Nuova Consonanza in Rome, GoG/Teatro Carlo Feilce in Genova, Sala Chavez - Unam in Mexico City, Sibelius Academy in Helsinki, Beethoven Haus in Bonn (Germany) to name a few. He is the founder and teacher of the Italian Accordion Academy in Urbino/Amsterdam and he holds masterclasses all over the world: Paris Conservatory of Music, Royal Academy of Music of London, Sibelius Academy in Helsinki, Danish Royal Academy of Music of Copenhagen, Chopin University Warsaw, Conservatory of Barcelona, Amsterdam Conservatory, HEAR Académie Supérieure de Musique Strasbourg, Yoliztli Academy in Mexico, Tianjin's Conservatory (China), Rome Conservatory. He has taught accordion at the “Luisa D’Annunzio” Conservatory in Pescara (Italy) from 2011 to 2014. He has performed with Francesco Dillon, Joel Rubin, Stefano Scodanibbio, Prometeo String Quartet, Michel Godard, David Moss, Terry Riley, Kálmán Balogh, Pierre Favre, Daniele Roccato, AlterEgo ensemble, Kathleen Delaney (choreographer) and as a soloist with “La Scala” Symphony Orchestra Milan, Haydn Orchestra Bolzano, Filarmonica Marchigiana, Sinfonietta del Teatro Lirico Cagliari (Italy), Ensemble L'Instant Donné (France), Romanian Radio Symphony Orchestra. His CDs are published by Schott Wergo, Bridge Records, Stradivarius, Da Capo Records, W&B Music, Rivoalto, StileLibero, Musica & Poesia, Ema Records, Adatto, Blowout Records. His performances were broadcasted by Radio3 RAI, ORF, DeutschlandRadio, RNE2, Vatican Radio, SFB, RSI, Radio Unam-Mexico, RadioFrance. He was invited as a jury member by international accordion competition in Castelfidardo, Klingenthal, Arrasate, Moscow, Pula, Valtidone and Novi Sad. He has published the books Technique I for button accordion (Bèrben) and Mastering Accordion Technique: a new approach to accordion playing based on the Alexander Technique written together with Kathleen Delaney. He has edited four books of the series Modern Accordion Perspectives, coordinating an international expert panel of the leading classical accordion performers and teachers. György Ligeti: (b Dicsőszentmárton [Diciosânmartin, now Tîrnăveni], Transylvania, 28 May 1923; d Wien, 12 June 2006). Hungarian composer. After being exposed to two tyrannies in his youth, Nazi and Stalinist, he left Hungary following the 1956 Russian suppression of his country’s independence and found himself, in western Europe, confronted by another stern ideology, that of the Darmstadt-Cologne avant garde. The effect was twofold. He was liberated to pursue long-cherished ideals of musical advance, but at the same time his critical, contrary spirit was sharpened. Unlike many of his young colleagues in the west, he was suspicious of system, rejoiced in the delightfulness and evocativeness of sound, and steadily reintroduced – though in quite new ways, guided by an exact ear – things that serial orthodoxy had refused, such as simple harmonies, ostinatos and palpable melodies. Just when this process of recuperation might have led him, in the early 1980s, to join the new dominant movement of postmodernist collage and retrospect, he found further stimulation and contradiction in non-European musical cultures, especially Caribbean, central African and East Asian. Always paradoxical, he found this music of the world enhancing his sense of himself as musically a Hungarian, and began to publish or republish many of the compositions he had written decades earlier. Jacob van Eyck (b ?Heusden, nr 's-Hertogenbosch, 1589/90; d Utrecht, 26 March 1657). Dutch carillonneur, bell expert, recorder player and composer. He inherited the noble title of ‘joncker’, and was blind. He spent his early years in Heusden, and in 1623 visited Utrecht, where he was appointed carillonneur of the Domkerk in 1625. Three years later he became director of the Utrecht bellworks, having technical supervision of all the parish-church bells. Later he also became carillonneur of the Janskerk, the Jacobikerk and the city hall. It was he who discovered the connection between a bell's shape and its overtone structure, which enabled bells to be tuned properly. In this he had the cooperation of the famous bellfounders François and Pieter Hemony. His work gained the attention of such prominent intellectuals as Isaac Beeckman (1588–1637), René Descartes and Constantijn Huygens (a distant relative, and dedicatee of van Eyck's Der Fluyten Lust-hof). He was charged with carillon improvements all over the northern Netherlands and had several pupils. In 1649 his salary at the Janskerk was increased, ‘provided that he would now and then in the evening entertain the people strolling in the churchyard with the sound of his little flute’, a practice that was first mentioned in a poem of 1640. His two-volume Der Fluyten Lust-hof, which was reprinted several times, contains almost 150 pieces for solo soprano recorder in C. The original prints contain many errors, mainly due to van Eyck's blindness. A few of the pieces are free compositions (preludes and fantasias), but the majority consist of variations on melodies popular at the time. Although most of these melodies have Dutch titles, many originate from the French air de cour repertory, and some are Italian (from Giulio Caccini, Gastoldi), English (Dowland), German and Dutch; 16 were borrowed from the Genevan Psalter. The process of composing variations was called ‘breecken’ (breaking): the notes of a theme were broken into notes of smaller values, each reprise becoming increasingly elaborate. Although van Eyck's ornamental style shows many features of Italian improvised passaggi, his pieces are to be considered as true compositions. Der Fluyten Lust-hof, i (1649) includes five duets that make use of some of the monophonic variations; these arrangements are not by van Eyck and can be attributed to his publisher Paulus Matthysz.